Despite what the cover says, this is not an ‘Honest-to-Goodness’ live recording. It’s not even close. What this LP actually is is a string of Jimmy Reed hits with crowd noise overdubbed. You know how I can tell? There are several ways. Reed and his band sound like they are in the studio. The vocal performance, the guitar playing, everything sounds clean. They don’t sound like they are playing in a club or coffee house. 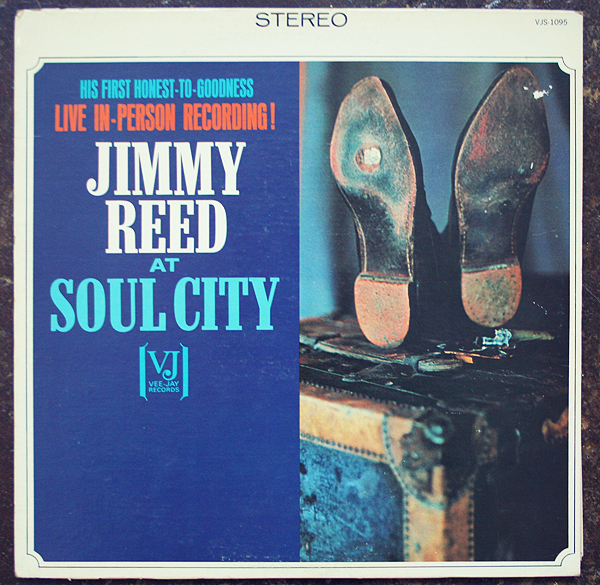 Reed doesn’t showboat on these recordings like most blues guitarists would playing live, or even introduce the songs he’s playing. The crowd cheers at odd points during the music, and the applause comes in a beat too late after the music fades out. The music fades out?!? Yes, when was the last time you heard a band’s music fade out after what should be a bull of a performance? Exactly. I was initially suspicious of the record being a live recording before even playing it, thanks to the track listing. The record opens with the songs “I’m Going Upside Your Head” and “The Devil’s Shoestring Part II,” an A and B-side single I’ve had for years, one that I’m quite fond of. Those performances are not ‘live’ in the sense “At Soul City” is, I’m afraid. Additionally, the time stamps on all the songs are very close, 2:30 on average, like what you’d find on a 45RPM single. Real live versions of these songs would obviously be longer in length. This record also tips its hand by not even really talking about the performances on the sleeve jacket, except for the one sentence paragraph at the end. Ultimately, this record just serves as another attempt to repackage existing material to the unknowing consumer. However, after a listen and knowing the crowd noise is overdubbed, much in the same manner as The Rolling Stones’ “Got Live If You Want It” record, “At Soul City” turns out to be quite annoying to listen to and not worth the effort to buy. The poor attempt to make the public believe this is an ‘honest-to-goodness’ live record makes me actually feel like I received a crappy Christmas gift, but the limit on making a return/exchange has already passed, and I’m stuck with a dud. 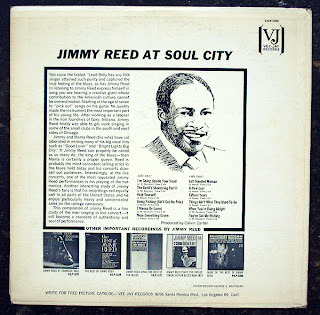 Granted, I can still look past the annoying filler of the overdubbed crowd noise and enjoy the music by itself, but in the long run it would make more sense just to play all the singles “At Soul City” is comprised of and have a greater and more pleasurable listening experience. I don’t normally trash talk a record by an artist I admire, but I don’t get the feeling Reed had much to do with this release. 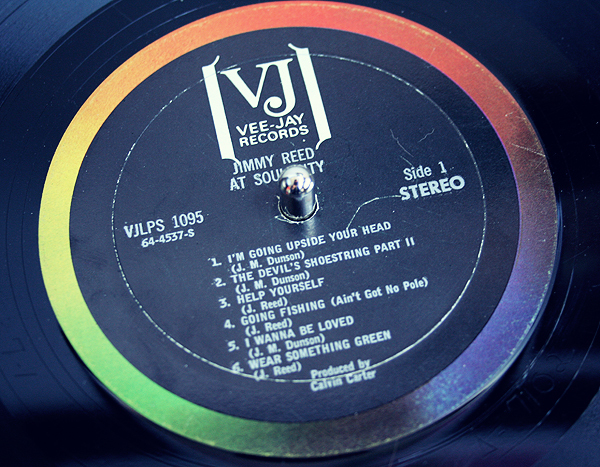 Again, it was probably the brainchild of an A&R man at Vee-Jay to shift some more vinyl. “At Soul City” turns out to be just another instance of ‘buyer beware’. Should you be interested in a real deal Reed live record, check out his ‘Carnegie Hall’ performance from 1961. On a side note, I hope all you music and vinyl fans out there had a wonderful holiday season and are looking forward to great and rewarding possibilities in 2012. Should you need an additional Classic Waxxx fix during the week between write-ups, be sure to check out the new Classic Waxxx Tumblr page for a visual feast of awesome records from around the world. This entry was posted on Thursday, January 5th, 2012 at 9:33 pm	and is filed under Music, Reviews. You can follow any responses to this entry through the RSS 2.0 feed. You can skip to the end and leave a response. Pinging is currently not allowed. If you listened as carefully to the so-called “live” recording at Carnegie Hall as you did this sham, you’d realize that the earlier disc is a just as much a series of studio recordings as Soul City. No way is it live, and VeeJay didn’t even try to fool us with bogus SFX. Would that it had been…..